Order picking is an activity in a warehouse, carried out by a team, where customer orders are prepared. It is also the activity with the highest logistic costs in a company. 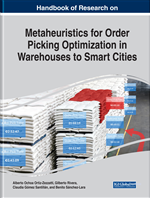 In this chapter, a proposal is presented aimed at improving the order picking process in a warehouse. Order picking continues to attract the attention of people in charge of optimizing processes in a company for minimizing costs. There are several approaches to order picking such as discrete picking, batch picking, and zone picking. The purpose of this study is mainly oriented toward the reduction of batch picking times to achieve an improvement in the service. In this chapter is proposed the application of compensatory fuzzy logic (CFL), which is a branch of classical logic and is also discussed the possibility of making real-time order batches (dynamic batching) by using compensatory fuzzy rules for the classification of incoming orders. One way to define order picking is as: the activity in which items conforming customer orders are retrieved from their storage area (depot) in response to these orders (de Koster, Le-Duc & Roodbergen, 2007). According to revised scientific literature, it was observed that this is the activity within a warehouse with highest logistic costs. Compensatory Fuzzy Logic (CFL): The compensatory fuzzy logic is a branch derived from the classical fuzzy logic proposed by Zadeh (1965) . To be considered compensatory it must comply with a series of axioms mentioned by Cejas-Montero (2011) , the most representative is the compensation . Batch Picking: Within the problem of warehouse management, it is the activity that generates order batches from different orders, deciding which ones are going to be batched together to optimize the travel distance and reducing the time for order picking. Archimedean Compensatory Fuzzy Logic: The Archimedean compensatory fuzzy logic is a theoretical combination of two different logics to combine them according to the order, but with diverse meanings. It is a way to link the classical definitions of t-norm and t-conorm with the compensatory fuzzy logic. Knowledge Discovery in Databases (KDD): The knowledge discovery can be defined as the non-trivial process of identifying valid, potentially useful and understandable patterns from a large amount of data. The fundamental objective of the KDD is to discover useful, valid, relevant and new knowledge through the use of various algorithms, that allows the improvement of processes. Fuzzy Sets: This type of sets contains a degree of fuzziness, where each of its elements as they are closer to 1 belongs more to this set, and as they get closer to 0 belong less to the set. As it is implied the elements in this set have values in the interval [0,1]. Membership Function: Defining X as a collection of objects which are represented by the letter x then a fuzzy set A in X is defined as the set of ordered pairs where is called membership function.